This is further emphasized by the fact that Daniel is not among the condemned, nor is he even named as being present at the dedication and festival of the pagan idol - he could have been ill or away on government business - but he certainly would not have bowed before the idol. Babylonian justice was swift and condemned the Three Children before Daniel could intercede. 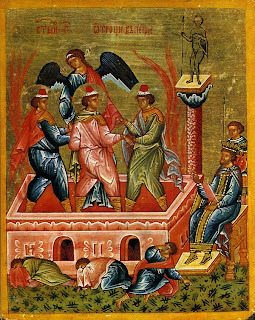 According to The Great Synaxarion, the reason that Daniel was not cast into the furnace is as follows: When the chief of the eunuchs [Dan. 1:7] and/or Nebuchadnezzar [Dan. 5:12] renamed Daniel Baltasar (Belteshazzar), it was derived from Bel, the name of the chief god of the Babylonians, who were devout fire-worshipers. Thus Nebuchadnezzar states: "Daniel came, whose name is Baltasar, according to the name of my god..."(Dan. 4:5 LXX). 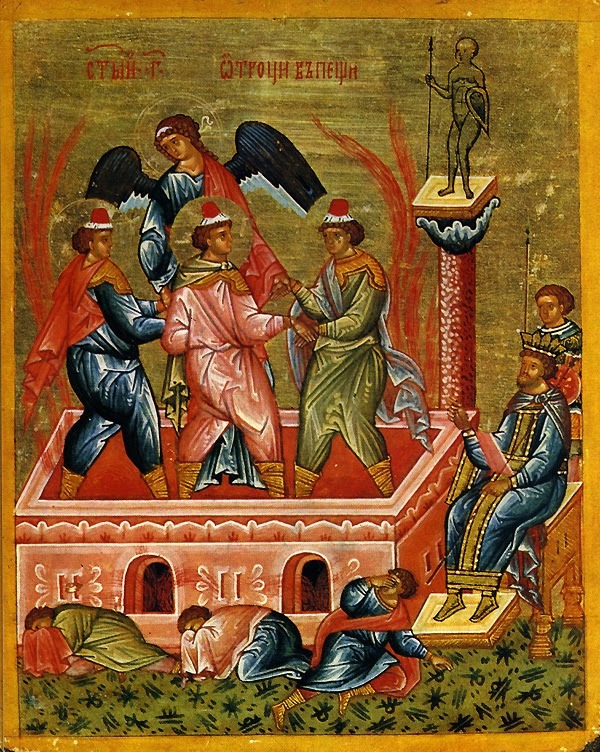 By divine providence, God dispensed that Baltasar not be cast into the flames with the Three Children, lest the fire-worshipers ascribe the miracle that was to take place to their Babylonian god, Baltasar. "According to the story of the Three Children in Babylon [Dan. 3], the flame of fire was divided; for when the furnace poured forth fire forty-nine cubits high it burned up all those around [Dan. 3:22], but by the command of God, it admitted the wind within itself, providing for the boys a most pleasant breeze and coolness as in the shade of plants in a tranquil spot; for it was as the blowing of a wind bringing dew. It is far more wonderful for the element of fire to be divided than for the Red Sea to be separated into parts, Nevertheless, the voice of the Lord divides the continuity and unity in the nature of fire. Although fire seems to human intelligence to be incapable of being cut or divided, yet by the command of the Lord it is cut through and divided. I believe that the fire prepared in punishment for the devil and his angels [Mt. 25:41] is divided by the voice of the Lord, in order that, since there are two capacities in fire, the burning and illuminating, the fierce and punitive part of the fire may wait for those who deserve to burn, while its illuminating and radiant part may be allotted for the enjoyment of those who are rejoicing. Therefore, the voice of the Lord divides the fire and allots it; so that the fire of punishment is darksome, but the light of the state of rest remains incapable of burning." "Your most wondrous childbirth's awesome mystery, this...did the godly youths once clearly depict of old, as they stood in the flaming fire and were not burned thereby, O undefiled and most holy Virgin." "The furnace did not burn the three youths, thereby prefiguring your childbirth; for without burning you, the divine Fire dwelt in you." "Your faithful and holy youths, who walked amid the fiery flames as in dew, mystically prefigured Your coming forth from the Virgin, which has shown upon us without consuming us." "That You might show forth Your birthgiving from the body of the Virgin, O Master, You did save the bodies of the virginal youths in the furnace." "The fiery Assyrian flame that prefigured You quenched, changing it to dew." "The three godly children who were sprinkled with dew in the fire plainly prefigured how the Most High God, Who shines with the bright rays of a threefold holiness, should mingle with mortal men, to their great blessing, consuming all deadly error in the fire of dew." "In the flame, the youths prophetically inscribed the image of the Trinity with the pen of faith in immaterial ink; and they mystically beheld the Logos's extreme descent to the earth and have proclaimed it to all." "The Babylonian furnace, as it poured forth dew, foreshadowed a marvelous mystery: how the Jordan should receive in its streams the immaterial fire, and should encompass the Creator, when He was baptized in the flesh." "Of old the holy children strengthened by the fire of fasting [Dan. 1:8-16], quenched with dew from God the fiercely burning flames. By fasting, let us also quench the furnaces of all the passions, that we may escape the flame of Gehenna." "Once in Babylon fasting made the Children stronger than the fire. Be not faithearted, O my soul, but follow their example, and you shall quench the fire of sensual pleasure with the dew of the Spirit."